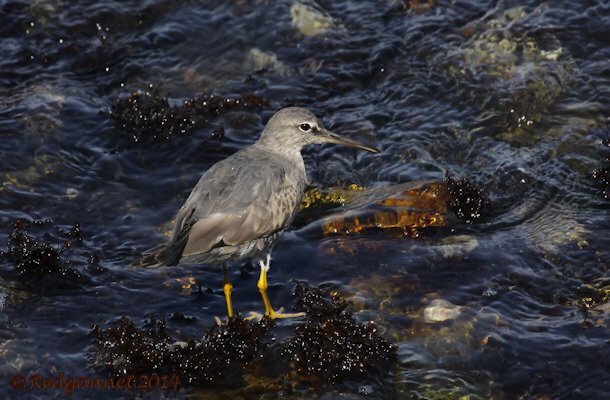 It was the bobbing action on the rocks that drew my attention to the bird. 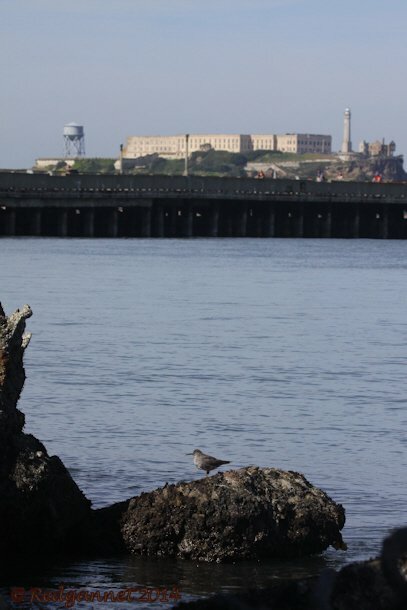 This was a family vacation and I had led my unsuspecting wife and son out onto the curving pier at Aquatic Park, overlooking San Francisco Bay, ostensibly to get a better look at Alcatraz and the bridge, but actually with half a mind to finding a Wandering Tattler. I had seen one in the same location earlier in the year and was hoping to bump into it again before it headed north to it’s breeding grounds in the Arctic. The tide had receded slightly and the favoured roosting spot on the crook of a rundown pier was deserted in favour of the rocks on the west side of the protected harbour. The bird was feeding actively amongst the rocks to the north of the sailing club. The sidewalk runs right beside the harbour and a low wall allowed an excellent view. There was only one individual today, though up to 5 have been reported here this season. 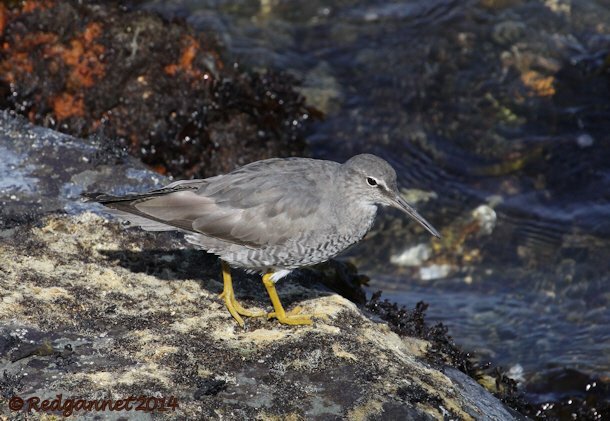 The Wandering Tattler is a winter visitor to the southern half of the west coast United States, but can occasionally be seen on Pacific islands or along the north-eastern coast of Australia. It has a plain grey back in all plumages and a heavily barred underside as breeding colours. The bill is medium length and straight. 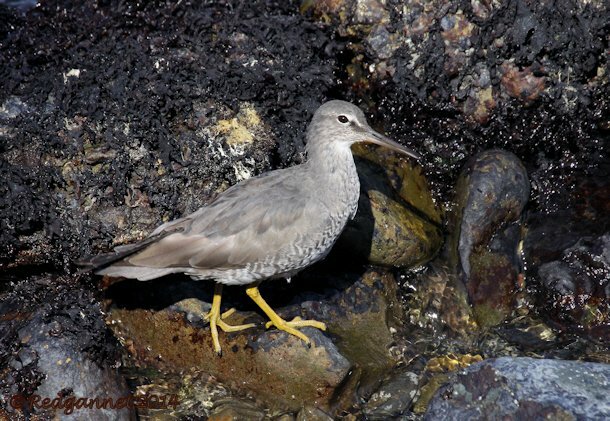 It’s bright yellow legs are short (compared to other medium-sized yellow-legged waders) and there is very little contrast between back and tail. 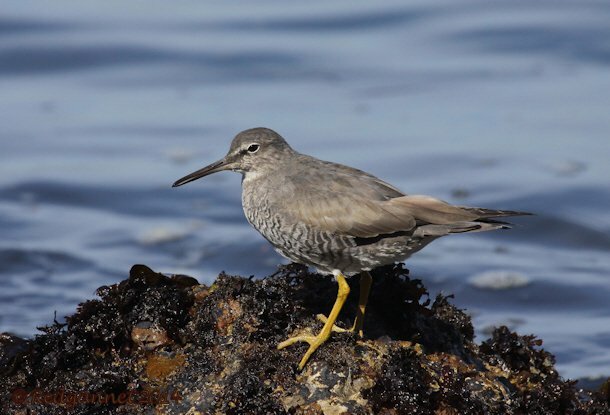 The teetering action is similar to that of the Spotted and Common Sandpipers, but the Wandering Tattler is larger and does not have the staccato flight action. It can be seen along rocky coasts and feeds close to the water mark as the tide recedes, picking around the rocks and through the seaweed. Gorgeous photos and very instructive! Thank you!